More than 1,000 gay and lesbian Minnesotans came to the Capitol on Thursday to protest a proposal to remove sexual orientation from the state's human rights law. They called the bill "mean-spirited." The bill's author says he wants to prevent homosexuality from being taught in the schools. St. Paul, Minn. — Outfront Minnesota's largest-ever GLBT lobby day included a rally in the rotunda, where more than 1,000 supporters packed the three levels of the Capitol. Explorer Ann Bancroft told the crowd that she's overcome many physical obstacles during her polar expeditions. "But the greatest obstacles that I have faced in my life have not been on the ice. They have been people's attitudes about what I can and cannot do, what I shouldn't and what I should not do. And today we're here to continue to change attitudes so that the people that come beyond us, behind us, will not face the obstacles that we have been facing." Bancroft says the state's human rights law doesn't include special rights for gays and lesbians, but simply basic human rights. Bancroft, a former teacher, says the law protects gay and lesbian teachers and students from discrimination, and is not used to teach homosexuality in schools. Rep. Arlon Lindner, R-Corcoran, disagrees. "In some of the schools, we've got children as young as three, in pre-school, on up through the years that are being taught homosexual practices. And it doesn't mean they're going to be homosexual, but unfortunately they hear about some of the sexual activities of the homosexual, and they're being told that it's safe and so forth and healthy, and it isn't." Lindner says parents have complained to the schools, and administrators have told them that there's nothing they can do because of state law. Lindner's bill would remove a 1993 provision that added sexual orientation to the state's human rights law. He met with several gay and lesbian Minnesotans who wanted to know why he's pushing for the bill, and says he tried to explain his position. It's my understanding that gays have hundreds and even thousands of partners over a lifetime. "I don't hate any of those people. I know they accuse me of hating and wanting all kind of terrible things to happen to them, but I don't hate any of them. I do love them. Actually this would benefit them if they were to leave that lifestyle or if they would maybe be more faithful to one partner, if it's got to be that way. 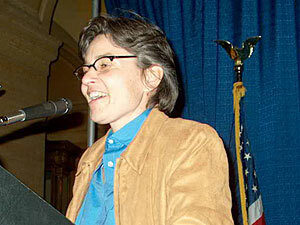 But it's my understanding that gays have hundreds and even thousands of partners over a lifetime," Lindner said. Lindner acknowledged that he's no expert on the subject. Gay and lesbian Minnesotans take offense with Lindner's comments, and say most gays and lesbians are in committed relationships. They also object to Lindner's suggestion that homosexuality is a lifestyle choice. Anders Matteson, 17, of Minneapolis says he realized he was gay in junior high. "It wasn't because I was under the sinister influence of homosexual militant leadership. That's an actual quote from Arlon Lindner. In fact, I didn't see homosexuality anywhere around me. Whenever I did encounter the word 'gay,' my pulse literally rose because it was like a validation that I exist," Matteson said. The crowd also heard from former Minnesota Viking Esera Tuaolo, who publicly admitted he is gay after retiring from the NFL. Tuaolo told the crowd Lindner's bill is wrong, and gays and lesbians need to make their voices heard. Gov. Tim Pawlenty says he welcomes them to the Capitol. "Our administration, and I, support human rights. Now we don't support special rights, but like I said before, I supported the 1993 bill, I have some concerns about aspects of it, but I don't think people should be thrown out of a restaurant or other accommodation or a house simply because they're gay or lesbian." During the campaign, Pawlenty said the one vote he regretted during his 10-year legislative career was his 1993 vote for the bill that added sexual orientation to the human rights law. But he has since said he would not support Lindner's bill. Republican House Speaker Steve Sviggum of Kenyon says he doesn't support Lindner's bill either. Sviggum says it's too broad, and is not likely to pass the House. Lindner says he hasn't been able to get a hearing on his bill yet, but says he's confident if it passed the Legislature, Governor Pawlenty would sign it.